At approximately 8:30 p.m. on August 2, 2018, Sheriff’s Detectives from the Special Investigations Bureau, while assisting the Santa Barbara Police Department with saturation patrols related to the Fiesta celebrations, conducted an enforcement stop in the area of Milpas and Highway 101. 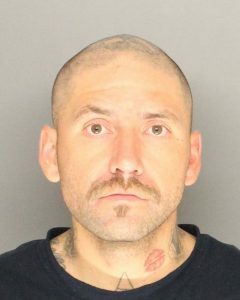 During the stop, detectives observed the two occupants to be nervous and the driver, 29-year-old David Olaf Barajas of Santa Maria was believed to be under the influence of a controlled substance. 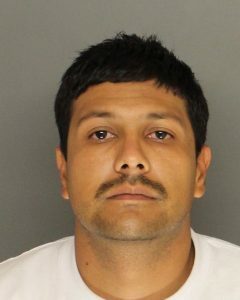 Through their investigation, it was discovered the passenger, 30-year-old Isael Jesus Elenes of Santa Maria was on active probation for trafficking narcotics and fleeing from law enforcement in a vehicle. Pursuant to the terms of his probation, a search was conducted and a Santa Barbara Police Department K9 team was requested. During this search, SBPD K9 “Jack” responded to his handler with a positive alert for drugs inside the vehicle. 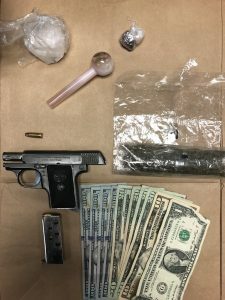 Detectives continued the search of the vehicle and located more than 25 grams of methamphetamine, nearly 5 grams of heroin, cash and a loaded semi-automatic handgun concealed within. Barajas and Elenes, both suspected criminal street gang members from Santa Maria, were subsequently arrested for possession of drugs for sales, being felons in possession of a firearm, and several other charges related to drug sales. Both men were booked into the Santa Barbara Main Jail without incident. Barajas is being held on $500,000 bail and Elenes is being held without bail. The Sheriff’s Office collaborated with other law enforcement agencies once again for Old Spanish Days to help ensure public safety during this historic community celebration. As the weeklong event comes to a close, the Sheriff’s Office reminds those attending Fiesta activities to pay attention to their surroundings, look out for increased pedestrian activity and as always, if you are drinking, designate a sober driver.